The cost of paving a driveway is mostly about the labor involved. A driveway can contribute significantly to the overall curb appeal of a house so, it makes sense to make sure it looks its best. Fortunately, there are a number of driveway materials available to the homeowner, whether you are starting from scratch or replacing an older driveway. The cost of the driveway depends on what material you choose, and how much labor is involved in installing it. All driveways consist of multiple layers of materials. The top visible layer is supported by a stone base that rests on compacted earth. 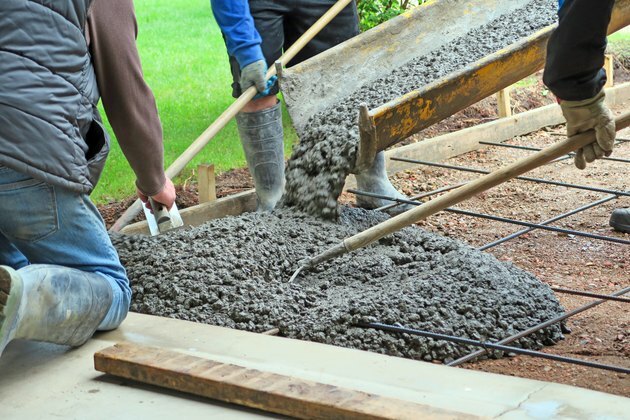 The typical driveway assembly can be 8 to 12 inches thick, and the slab is generally sloped to shed water. Driveways are priced by the square foot, and square footage is calculated simply by multiplying the width by the length. So a driveway that measures 12 feet wide by 25 feet long would be 300 square feet. If you are building a driveway where one did not exist, check with the local building code authority. Many municipalities have restrictions on the width of the driveway and on how close to a street corner the driveway opening is allowed. The code authorities may also have something to say about the driveway apron, which is the sloped section that connects the drive to the street. The size of the apron, how much it slopes and the materials that can be used may all be covered by local codes. When having a new driveway installed, the first order of business is to get rid of what is already there. Usually, the contractor who will be installing the new driveway will remove the old one. Expect to pay $2 to $4 per square foot to remove an old asphalt or concrete driveway. Gravel driveways are popular in rural areas and for vacation homes and beach houses because they are inexpensive and they have a casual, laid-back look to them. Despite their simple appearance, a well-built gravel drive still consists of three layers of different size stone. Each layer is mechanically compacted to provide a firm base. Asphalt driveways are the most type of driveway because they are relatively inexpensive and can last for years. 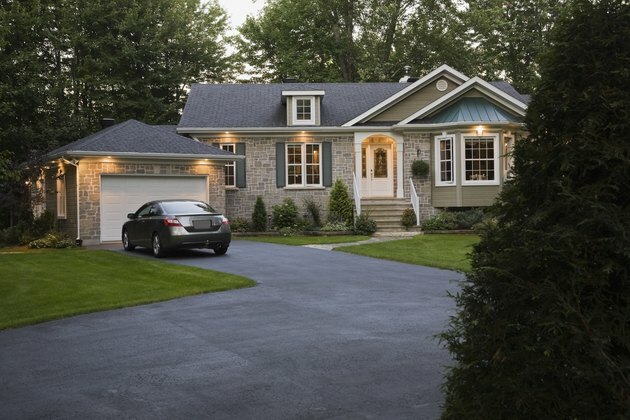 Asphalt is the default choice for many homeowners. The typical installation includes 2.5 to 3 inches of asphalt on top of about 6 inches of stone. It is possible to add stone or timber edging to the finished drive. Asphalt drives need to be sealed every 2 to 5 years. If the surface is damaged, a contractor can remove the top layer and add a new top coat for $1 to $3 per square foot to freshen the drive. The salesman says he has material left over from another job so he can repair your driveway at a discount. Legitimate contractors know how to specify the amount of material they need for a job and never have enough left over for another project. You are pressured to make a quick decision. There is no written estimate or contract. It is a cash-only deal. 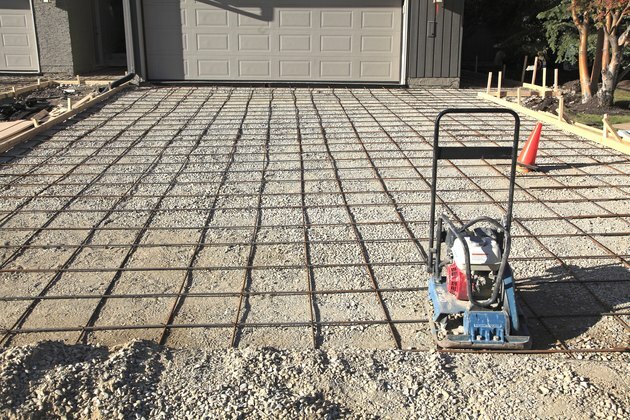 Rebar in place during construction of a poured concrete driveway. These drives consist of 4 to 8 inches of crushed stone under a slab that is a minimum of 4 inches thick. The edges usually receive an extra inch or two for strength, and metal rebar provides structural support. For decorative purposes, the paving contractor can install stamped concrete, which allows for different patterns and textures as well as additional colors. Expect to pay $12 to $18 per square foot for stamped concrete. Concrete lasts a long time with little maintenance. 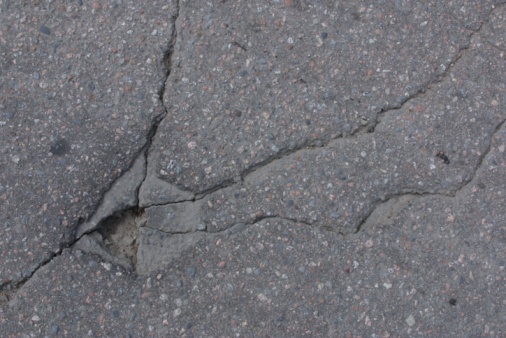 But chipped and cracked surfaces can be removed and resurfaced at a cost of about $2 to $8 per square foot. Interlocking concrete pavers offer the most in terms of styles and designs. The pavers are available in different shapes, sizes, designs and colors. They can be made to look like most types of natural stone. Six inches of stone support an inch of bedding sand. The contractor will fill the joints between the pavers with sand. Pavers that are damaged or subject to frost heaving are easy to replace. A more expensive option for a driveway is one made from brick or concrete pavers. Permeable pavers are an alternative to standard pavers. Wider joints between the pavers are filled with fine gravel, and the base layer of stone can be up to 20 inches deep. This allows surface water to drain and be stored in the deep base layer, where it will be absorbed by the surrounding earth. The system is designed to prevent runoff, which can carry pollutants to storm drains and waterways. Expect to pay a 20 percent premium for permeable pavers over the cost of standard pavers.